A case of too good to be true? 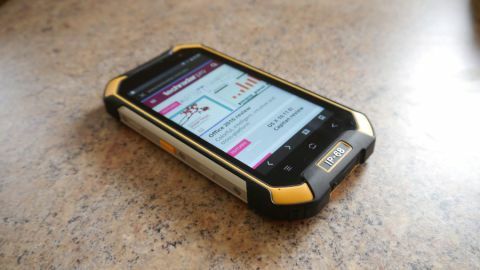 An impressively tough handset which is a good all-rounder for those wanting a rugged phone with plentiful battery longevity. Android vendors are roughly where PC vendors were 20 years ago, the golden age of desktop personal computers, with dozens of brands and hundreds of models thriving and catering for the needs of seemingly everybody. The Blackview BV6000 fits in one of these niches, targeting the growing number of smartphone users who are looking for something a bit more resistant than your usual run-of-the-mill handset. This one can take knocks and bumps, not to mention being immersed in water. This review sample was provided by Gearbest which sells the BV6000 for $219.99 (about £170, AU$290) including delivery but excluding VAT and handling fees. Before you commit to any purchase, it's well worth checking out our guide to buying tech from online Chinese retailers. Out of the box, the first thing that struck us about the BV6000 was the design which reminded us of the Cat S60 smartphone but without the FLIR thermal camera. It is big (152 x 81 x 16.6mm) and heavy at 243 grams. This isn't your usual slim and lightweight Android smartphone, far from it. There's no branding on the front except for 'IP68' which is printed in big lettering at the bottom of the device underneath the three menu buttons. That certification – IP68 – means that no dust can enter the enclosure (if the seals are in place) and the phone can stay in more than 1m of water for at least 30 minutes. As expected therefore, there's plenty of rubber and metal all round to protect the BV6000 from bumps and shocks. It has a CNC full metal frame and a polycarbonate plus fibre glass enclosure to hold things in place, and the display's Corning Gorilla Glass 3 should resist scratches and a bit more. Where the BV6000 outclasses almost all of its competitors (bar the S60) though is when it comes to the components used – hardware that's comparable to midrange smartphones. It actually has a lot in common with Cat's flagship handset. Both have a 4.7-inch HD display, a 13-megapixel rear camera, a 5-megapixel front snapper, 3GB of RAM, a microSD card reader, 32GB on-board storage, dual SIM (you can use both simultaneously) and stock Android 6.0 Marshmallow. On the left-hand side of the phone is a camera button, a PTT (push-to-talk) one and an SOS button. Pressing on the latter once brings up a list of contacts, allowing you to send an SMS with your GPS location and a default message. Pressing on it for more than five seconds allows you to lock the phone and set it in a 'distress' mode, sending a distress signal every 30 minutes, allowing it to conserve battery. We didn't try this, though. Pressing the camera button for five seconds when the phone is unlocked brings up the camera app. Pictures snapped by the Omnivision sensor produced adequate results in broad daylight with plenty of detail and great colour reproduction thanks partly to its F/2.0 aperture, allowing more light in. The front-facing camera is an 85-degrees wide-angle Omnivision part. As for the PTT button, you will need to download the appropriate app to use it. On the other side of the handset you'll find the volume buttons and power button. On top and bottom of the phone are the audio socket (with an atmospheric pressure sensor located next to it) and the microUSB port, both covered by rubber flaps that are screwed to the body. Blackview has judiciously bundled a few more flaps just in case. The IMEI numbers of the two SIM card slots can be found at the back, on a sticker with a removable cover, held secure with two screws, hiding the aforementioned slots and the card reader. The 4200mAh battery is sadly non-removable but that was expected. At nearly twice the capacity of a standard smartphone like the Galaxy S5 Mini, this battery should be enough to keep you going for days' worth of light usage, and the 10W fast-charge charger will allow you to quickly top-up when needed. As expected, the BV6000 is powered by a Mediatek SoC, the MTK6755, otherwise known as the Helio P10, an 8-core chip clocked at up to 2GHz with an ARM Mali T860 GPU. That should be enough to qualify as a midrange handset as demonstrated by its Antutu score of 46,561, far behind the likes of the first-generation OnePlus One or the iPhone 5S. Connectivity-wise, this handset doesn't do 802.11ac Wi-Fi. It covers the 800MHz, 1800Mhz, 2100MHz and 2600Mhz LTE bands and offers GPS, Glonass and Beidou navigation systems. It's also worth noting that in the box along with the handset, Blackview bundled a pair of screwdrivers, some leaflets and a pair of headphones which were next to useless. They didn't fit in our ear canals and ended up sounding like listening to music through a tin can. This is not your bog-standard smartphone – it will appeal to a certain crowd while others will abhor the handset's hard-as-nails design. Speaking of the latter, there is a video produced by Blackview showing the phone being tumbled and spun in a washing machine, coming out of that ordeal unscathed. Pretty brutal but representative of what a day in the life of a builder might be. For our part, we didn't venture that far, but we did test the phone under running water (see the above pic), an exercise which left no marks. The BV6000 does the job with the only things missing being a couple of notification LEDs and the ability to act as an emergency battery, both of which aren't deal breakers. This handset is a decent performer, and a good all-rounder that doesn't suffer from any glaring misses. The fact that it has a smaller screen and a lower-than-average resolution shouldn't distract from its main USPs, and we'd go as far as saying that this was done deliberately, not to cut corners but to save battery life.